Got a Samsung Galaxy S7 or a Samsung Galaxy S7 Edge? Then good news! Your device is about to be upgraded to the (almost) latest and greatest version of Android Nougat. The global rollout began this week, Samsung today confirmed, following weeks of testing to get everything ship-shape before hitting handsets. It's a significant upgrade, bringing with it faster speeds for app downloads and UI tweaks, among other features. The update brings a Quick Panel update for a "cleaner aesthetic" to the phones, with icons tidied up in the panel's first level. The S Finder in the Quick Panel is now also able to locate items on the smartphone or the web directly. Notifications are grouped to display more information efficiently, while there's an improved controller for pop-up split screen window views. 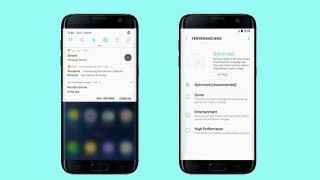 Performance Mode options are introduced, letting users optimize their devices for specific functions, from gaming to battery saving, while the Samsung Pass (the company's "master key" for logins on the web) is now supported by the Galaxy S7 and S7 Edge, making use of the secure fingerprint scanner. It'll soon get an additional update to work with mobile banking, too. The update has begun rolling out over the airwaves, so keep an eye on your notifications for your chance to install it.